However, as any marketing department will tell you, engineering excellence does not guarantee commercial success. People won’t buy consumer electronics just because they’re new – only if they can see how the new technology can improve their everyday lives will they invest. This is where Sony made its greatest mistakes – Elcaset. At the beginning of the nineteen seventies, a group of Sony product planners decided what the world needed was a new cassette system. In awe of the enormous success that its great European rival Philips was enjoying with Compact Cassette, yet thoroughly unimpressed by its poor technical performance, Sony hatched a plan. 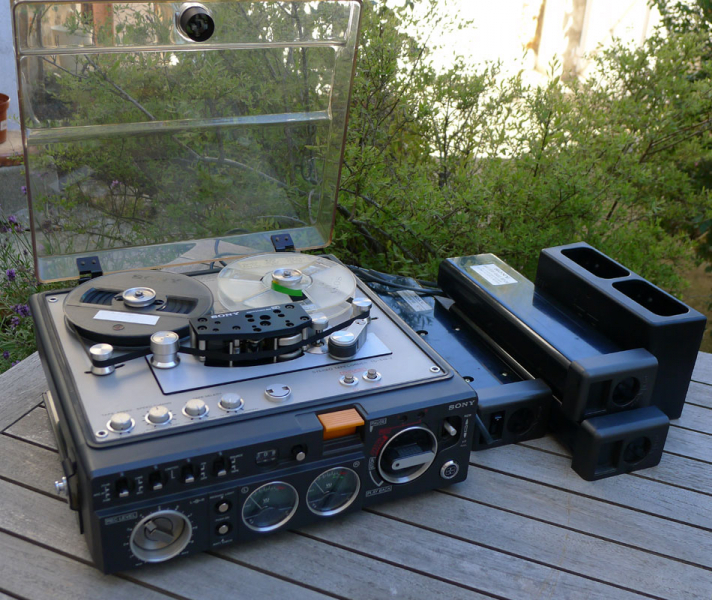 What if they could take the serious home recordist’s medium – open reel tape – and enclose it in a convenient cassette? Thus was born Elcaset, a format several times the size of conventional cassettes, but far easier to use than open reel. The tape ran at 3 3/4 ips, twice that of cassette, and was the same width as standard quarter track open reel. With Sony’s flagship Ferrichrome formulation, the new format boasted superb performance – with the top EL-7 deck Sony claimed a 20-27,000Hz (NAB) frequency response, no mean feat when its best cassette deck, the TC-229SD, could barely crawl past 16,000Hz! The only machines the company built were the EL-5 and EL-7, over-engineered monsters using extremely high quality components throughout. Although not as big as open reel machines, they dwarf today’s black boxes in size and weight – 13kgs of brushed aluminium, diecast transports, big ferrite heads and discrete components are not to be sneezed at. The two machines differ mainly in transport and head layout. The EL-5 is a two motor, two head machine, while the EL-7 has a three heads and a dual capstan closed loop transport for greater speed stability. This said, even the cooking EL-5 boasted a claimed 0.06% WRMS wow and flutter, a figure that puts many expensive modern cassette decks to shame. In action, either Sony deck operates smoothly and cleanly and are pretty foolproof, running smoothly and quietly. For a mid-seventies product, ergonomics are excellent, always a Sony forte, the only inconvenience being manual setting of bias and equalisation. With Ferrichrome tape they give a bright, clear, confident sound with none of the nasties you associate from anything lower down the cassette evolutionary scale than a Nakamichi. Even the single capstan EL-5’s pitch stability is excellent, with no cracking piano notes or wobbly violins. Harmonics are remarkably well preserved, with an ease and naturalness that has always given cassette a hard time, and treble had real sparkle. The record and replay amps introduce a touch of grain and hardness to the sound through the tape monitor circuit which doesn’t quite give the sumptuous analogue sound some would hope for, though. Sony also built the lower end EL-4, which is a EL-5 without soft touch operation, and the very rare portable EL-D9, that looks like na Elacset version of the TC 510-2 open reel deck, and shares a great part of its circuitry. The SONY ELCASET EL-D9 was a prototype only deck. The SONY EL-D8 was the portable model. Hi Tiago. I’ve just inherited an EL-D8. It looks to be in great shape. I’m wondering if there is supposed to be a power switch – of the option of having one – because of the inset 1-inch square beneath the “open” toggle on the outward facing end of the battery pack. Any thoughts? Hi Tony, with the battery pack there is no power switch, as the unit becomes off whenever there is no transport function enabled (like play, fast forward, etc). When using the power supply pack, there is a power switch, right next do the power cable, and the unit stays on even on stop mode (VU meters lights and circuits). Also, the VU meters are permanently lit. This is achieved because the the contacts on the other end of these packs are different between the battery pack and the power supply pack. You can see them here side by side on a TC-510-2, they’re interchangeable. Both units share many components, like playback amp, bias oscilator, etc.